So you got a new e-reader for Christmas and you’re looking for something good to read. If you’re a fan of nonfiction narratives, then you may find this January promotion exactly what you’re looking for. 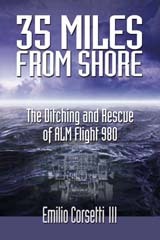 For the entire month of January the electronic version of 35 Miles From Shore: The Ditching and Rescue of ALM Flight 980 is 60% off. The regular price is $9.95. For all of January the price will be reduced to $3.98. There’s a good chance that you may find even further discounts on sites like Amazon. The electronic version of 35 Miles From Shore is available on all e-reader platforms. This includes: Kindle, Sony e-readers, the Nook, Kobo, and any device that can read an .ePub file format. Don’t have an e-reader but have a tablet or PC that you would like to use? You’re still in luck. Amazon offers a free Kindle app for most tablets and PC’s. You can see the app in action and read some excerpts at 35 Miles From Shore Excerpts. Don’t pass this up. This offer is good for one month only. Sorry for those of you hoping to get in on the special promotion. The price drop did not go through as expected. I have talked to my distributor about the problem and they assured me that it would be fixed promptly. Due to the delay in implementing the promotion, I will be extending it into February for one week.